A party scene, sure, but Shelter Island’s Sunset Beach is also fun for families. Book one of the revamped motel rooms with a sleeper sofa for the tots, and plan to spend days sunnings on the mellow bay beach or exploring the island’s laid-back restaurants. Tip: the front desk has children’s movies and some of the employees babysit on their off-days, so book ahead to have the kids rest with an afternoon flick while you enjoy a late lunch. The Maidstone puts preppy parents at the center of the East Hampton scene, walking distance to the shops and air kissing scene of Main Street and an easy jaunt to postcard-perfect Main Beach. The cottages are the best fit for families but tend to book up quickly in the summer, so plan ahead. The inn’s buzzy restaurant has kids’ menus and there are children’s books and games in the lounge, so don’t despair if you end up with a cloudy Saturday indoors. Those willing to battle the traffic to Montauk reap their reward at Haven, where one- and two-bedroom condos go for a more affordable price tag than at the trendier spots. Simple and chic, the white-on-white apartments include well-stocked kitchenettes, and there’s a courtyard pool for dips if the waves are coming in strong at the nearby beach. Around two-and-a-half hours north of the city in quiet Phoenicia, the Graham & Co. brings a dose of Brooklyn cool to the Catskills. Opened in 2013, the revamped motel digs supply a comfy stay in family-friendly double-queen and bunk bed configurations (some have kitchenettes), but most of your time here is spent exploring the grounds and surrounds. Set up camp at the outdoor pool (open from 8 a.m. - 7 p.m., but note there’s no lifeguard on duty), play in the three-acre gardens or admire views of Hunter Mountain from beside the communal firepit. Bikes are available for over-16s only, so take your tweens and tots for a walk around the town and be sure to hit Phoenicia Diner. Designed by the husband-and-wife Novogratz team, Hotel Dylan is the newest addition in artsy Woodstock, just over two hours from NYC. The 11 rooms are individually designed in a splashy, clashy mix of primary colors, graphic prints and textiles. All have views of the main lawn, outdoor ping pong table, hammocks and two fire pits. A restaurant is in the works, but until then the staff can point you to local favorites like the Bear Cafe, Joshua’s and frozen yogurt joint, Little Apple. Photo courtesy Costas Picadas/The Novogratz. Big spenders, this is your spot. These 18 cottages, each individually designed, now welcome families during summer weekends. 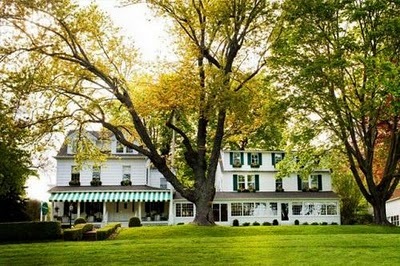 The food is legendarily good, and the setting in one of Connecticut’s prettiest corners is the stuff of country estate dreams. Favorite rooms for us? The Beaver Lodge, with a jacuzzi that fills from the ceiling (bathtime just became the kids’ favorite), and the Library, lined with books to inspire literary dreams.